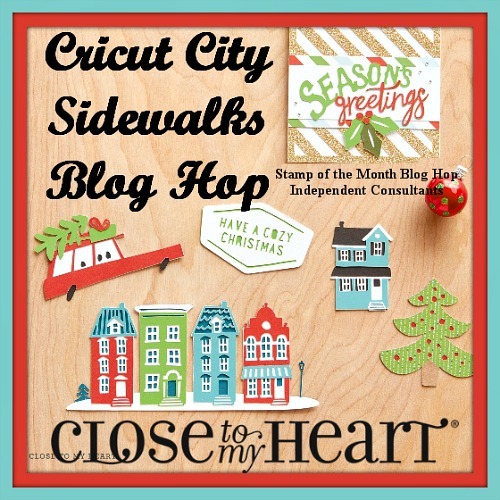 Welcome to our City Sidewalks Cricut Blog Hop! This special hop features Close To My Heart's exclusive new digital cricut cartridge - City Sidewalks! If you came here from Priscilla Gotham's Blog you are on the right track! When you get to the bottom of my post look for the next blog link to hop to the next blog! If you get lost, you can see the entire blog list HERE. This fun cricut cartridge goes great with the City Sidewalks paper and Compliments and also the "Joy to You and Me" stamp set! I created several cards with this set. Today I'll focus on one card and I will post the others I have created later on my blog. This card will be one of my 'dessert' cards in my upcoming Christmas Card Workshop. 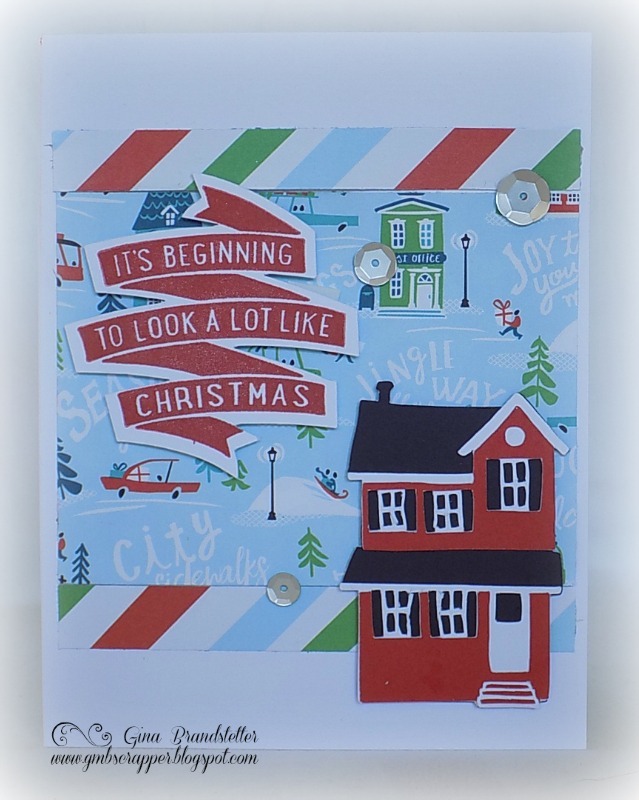 I just love this City Sidewalks paper with the houses on it and I wanted to use it as a background for my card. So I cut a larger house (using 2 1/2" for my size) from the cartridge. 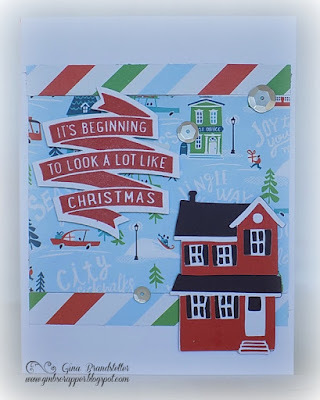 Three different colors of cardstock make up this house and they are all layered to create this look! Isn't it cute - right down to the front steps! I recommend cutting this house at 2 1/2" or larger, otherwise the cuts come out very tiny and even with my Explore this was not cutting well until I enlarged it. 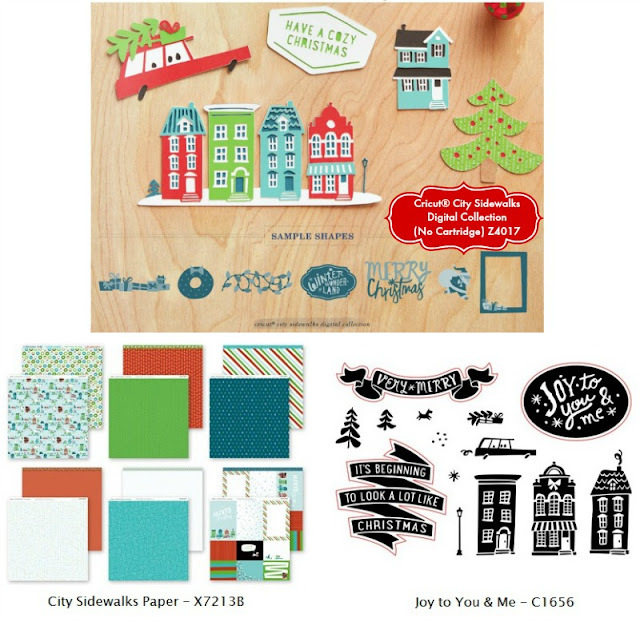 Also - be sure to set your Explore to the Custom Setting and use "Cardstock - Intricate Cuts". I used the Joy to You and Me C1656 stamp set with this card as well. The banner for this stamp coordinates with the Artistry Cricut Cartridge. I stamped it in Cranberry Ink. Next, I added Silver Sequins to finish the card. Next up is Vickie ODell's Blog. I can't wait to see what she has created! This is great Gina!! And thank you for the tips about the settings!!! I love how the house complements the background paper perfectly! Love your card and appreciate the tips. I'm new to Explore, so still have a lot to learn. Love this card, super cute. Thank you for the tips! Love your card! I didn't even know about that "intricate cuts" setting. Thanks for the info. And, you really balanced that busy paper with the banner sentiment. So cute! Such a fun card and thanks for the tip on 'intricate cuts'!